Well hello there, Big Bear! She sure is showing off for us with all of her vibrant and amazing colors everywhere we look! Truth be told; I’ve always wanted to visit Vermont to peep on all of the leaves, but only an hour and a half away from us is Big Bear Lake, so I’m able to get my fill of Fall close to home. No planes or full travel days required. Huge score. Okay, all of your outfits lately are speaking my language! This poncho is everything! Can’t wait to see more from your trip, I would LOVE to do some leaf peeping myself! What an awesome spot!! Those leaves are just gorgeous and I love your outfit! That poncho is everything .You look amazing and fall is definitely looking beautiful. 3 of my favorite things: OTS, Flares and YOU!!! Love this to bits and Fall Fabulous and gives me all the cozy feels!! Rocking a fav look on you girlfriend! Hope you had a ball this weekend! Beautiful fall photos! Love this whole look! What a pretty place to take pictures. You look super cute in this outfit. I’m traveling to Dallas, TX for the first time, in 3 weeks, and I don’t know yet if theer will be same beautiufl fall like we have on East Coast. Ah enjoy Vermont! We were so close to Vermont two weeks ago and the foliage is just gorgeous! Loving this cozy poncho!! I love love your sweater ! The sleeves are amazing ! I just absolutely LOVE these jeans. I totally fell in love with these jeans when I saw them on your insta. They are so much fun. I love that off the shoulder top too. That tree is just gorgeous behind you too! Drapey + cozy fall goodness right here! And loving those flares! I am fortunate to live in Michigan which has one of the prettiest Fall seasons in the world! 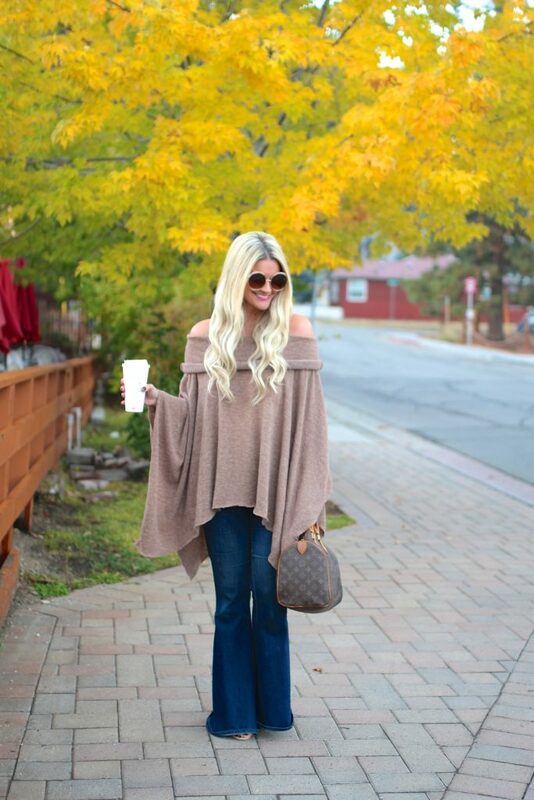 I do love that cozy oversized poncho and it works with the flared bottoms! I love the style of those pants, babe! Gorgeous! Love the flowy silhouettes of this look! So 70s! I have never been to Vermont but your photos say it is beautiful! Love the background and love your poncho! You are totally rocking this 70s vibe outfit and I am obsessed! So wonderful Shauna! I had to go back and look at old blog posts from 2 yrs ago to find changing leaves!~ we arent there yet. 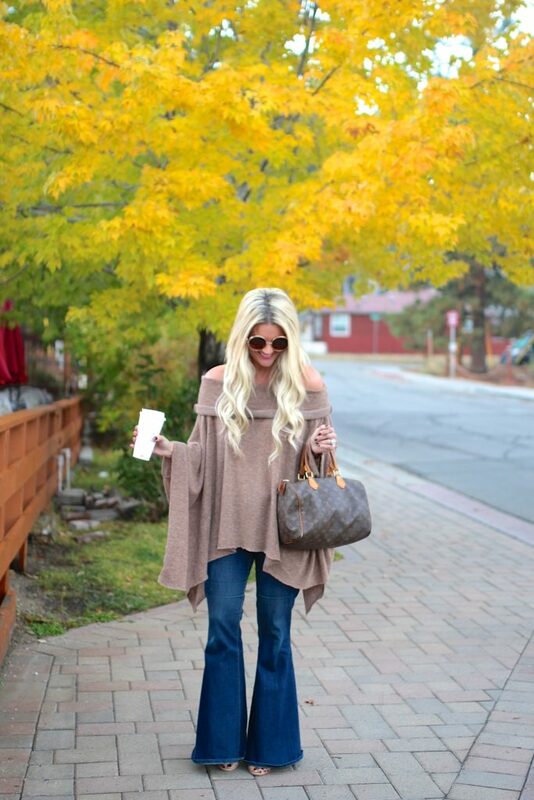 LOve the pics and this is such a fun look, love the flowy sweater with your cool flares! Loving this cozy look on you dear. You’re rocking that flowy sweater, and I love that you paired it with flared jeans, such a chic combination. This look is seriously amazing!! An off the shoulder poncho?? YES PLEASE!!! Absolutely stunning Shauna! Fall is seriously the best season. I live for all the fall colours! And I’m loving your 70’s vibes so chic and fabulous, especially those jeans. So good babe!